↑ "Sources: Celtics, Wolves closing in on KG trade". ↑ "Celtics to get Wolves' Garnett, sources say". ↑ "Celtics, Minnesota Timberwolves agree to send Garnett to Boston". ↑ Boston's Kevin Garnett Top Vote-Getter Among All-Stars, NBA.com, January 24, 2008. ↑ Garnett out of All-Star Game, Wallace in, Boston Herald, February 10, 2008. ↑ Steve Bulpett, No 'Big Ticket' for an All-Star event, Boston Herald, February 11, 2008. ↑ Marc J. Spears, Rondo will have to pay up, The Boston Globe, February 16, 2008. ↑ Kevin Garnett Reaches 20,000-Point Plateau, NBA.com, March 8, 2008. ↑ Steve Bulpett, C's go extra milestone - Numbers come up for Garnett, Allen, Boston Herald, March 9, 2008. ↑ Allen, Celtics breeze by Grizzlies for eighth straight win, Associated Press, March 8, 2008. ↑ Kevin Garnett Wins Kia Defensive Player of the Year, NBA.com, April 22, 2008. ↑ Kevin Garnett Wins NBA Defensive Player of the Year, Celtics.com, April 22, 2008. ↑ Marc J. Spears, Garnett wins NBA defensive player award, The Boston Globe, April 22, 2008. 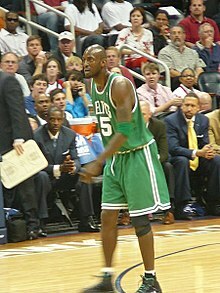 ↑ Couper Moorhead, KG Calls Defensive Player of the Year Award a "Team Effort", Celtics.com, April 22, 2008. ↑ Garnett becomes youngest to reach 1,000 games, leads Celtics past Bulls, Associated Press, October 31, 2008. ↑ Frank Dell'Apa, Rondo's deal is extended, The Boston Globe, November 1, 2008. หน้านี้แก้ไขล่าสุดเมื่อวันที่ 30 กันยายน 2559 เวลา 11:20 น.